Test your willpower and resist today’s striking headlines - can you? A huge sandbox is what a children’s playground and, let’s say a techno-beach-club have in common. A bar and defeaning noise on one side and a swing and slide on the other are the definite distinctions. Up until yesterday it still could’ve been either way, but ever since the playing apparatus were delivered any disco-dream supernovaed in an instant. This makes obvious, that a children’s heart is pumping in each adult’s chest: While the many parts of the playing devices are waiting to be put together, all the LCP workers seem to have forgotten work alltogether and play hilariously in the big sand box. What a shame! Zoom in and it becomes crystal clear: The complete crew has gone hysteric. Maybe the stress of the last weeks has been too much after all. In slight modification of that ancient east-frisian-joke (How many east-frisians are needed to change a light bulb? Answer: 5) you tend to ask: How many LCP workers are needed to get a bucket of sand from A to B? Well, count for yourself. Merely the furiously barking Senor Pepe is trying his best to remind the crew on its duties – even though in vain. But whatever the LCP crew stroke, it’s not contageous - the three guys from the company, that delivered the playing-apparatus seem to be unaffected by the collective craze. With routine and expertise they screw together the playing gear one by one. …and in the shadow of the tower and the hanging-bridge, which have also been erected, some members of our LCP-crew came back to their senses and to some serious piece of work. Thank God! …but what the heck is this? What is it for and where did it come from in the first place? Some bizarre objects leave our team completely baffled. They look a bit like not from this world. A donation from outer space maybe? After all, ET liked children, didn’t he? Lately the discussion came up, if a swimmingpool could round off the range of attractions on the playground. That would be fun. And, even better, economically smart! All we’d have to provide is the basin. The soggy stuff will be delivered from above – reliably, abundantly and absolutely free! More busy bumblebees - easily to identify by the Maya-the-bee-costume. What a great job they are doing! The old curbstone had completely forgotten what sunshine, wind or rain felt like. Speedy Gonzales has undoubtedly been the inspiration for this group of little co-workers painting many many fenceposts in such little time. Nils and Patrick are plastering the stonewall. What the camera missed: Seconds later, when they reached the corner, they banged together with their heads! But it was just a brief moment of shock – neither of them got hurt. For once it was an advantage to have such diehard iron-heads. These fair maidens present their contribution, consisting of several motifs they designed to embellish the inside of the play-tunnel. How does a piece of art like, for instance, Michelangelo’s frescoes of the Sistine Chapel manage to stand the test of time? Our artist’s approach show, that they must be in the know: It’s the proper priming, of course. Downright pussyfooted Leonhard almost completed the fence! But our photographer closed in on him. Just what is it about managers (at the right, on the phone) that gives us the dubious feel that they’re indispensable without doing anything really? A suspicion the ordinary craftsman of average intelligence (at the left, at the saw) will never have to worry to get under. In this case whatsoever Nils has just learned from his mailbox, that his mom is exibiting a series of little-Nils-as-a-baby-photos on facebook. Very popular: Ilonas wheelbarrow-taxi-service for little exhausted co-workers is booked up for days in advance. 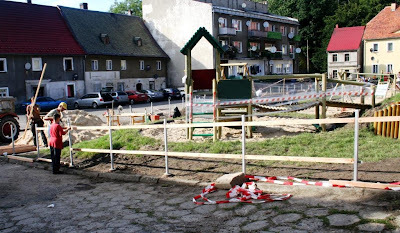 In their last issue the regional newsletter “Echo Izerskie” published an article about the playground project and in that context aroused the question: ‘Holosophy – what does it mean?’ Above the original words – down below the translation. Holosophy: What Does It Mean? Holosophic Society from Pobiedna, together with their friends, is a group of people who out of the goodness of their hearts want to selflessly help the others. “I am impressed by their work,“ said Mr. J. Surowiec(comment: the Mayor of the Region). The motto of the activity of the group from Wola Sokolowska, where is the seat of the Society, is just “doing good,“ even though this statement is not so popular nowadays. 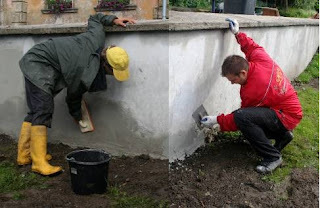 However, if even people from abroad join these activities, working at construction of a save playground for children, or (in co-operation with the Soltys and the Soltys Council) build snow fences, so that the road is not blocked by snow anymore, it certainly deserves heartfelt thanks. Moreover, the core of the Society’s activity is establishing proper interaction between people and animals, promoting vegetarian diet, etc. “Doing good“ is simply the matter of one‘s character.